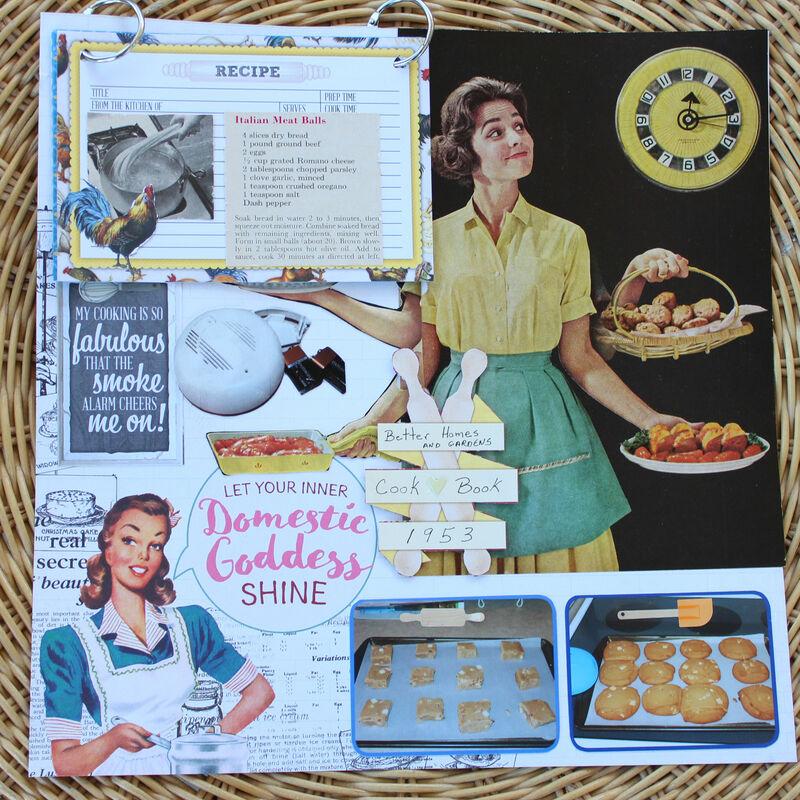 One of the themes for submissions for the next issue of Creative Scrapbooker was recycling a cookbook. Because my roomies here in Phoenix are enthusiastic garage and estate salers, I asked them to be on the look out for an old cookbook that I could possibly use for the submission. It wasn’t long before they came back with a perfect one that was in my price range of a dollar. It was a 1953 Better Homes and Gardens cookbook, complete with old fashioned pictures and life lessons. I set about making a layout using it. I admit that Vintage is NOT my strong suit and not my favorite style, but I did like the resulting page. So my friends, the operation was successful, but apparently the patient died as my layout was not selected for the magazine. In order to justify the $1.00 investment, I am publishing it here instead. Last summer I was lucky enough to go on a cruise around the British Isles! Okay Okay, I admit it, I wasn’t merely lucky…………I was SUPER LUCKY. Anyway, one day we took a tour from Belfast, Ireland out to Giant’s Causeway. On the way back, the bus stopped for a bathroom break. Those of us opting out of the twenty minute bathroom line up, were treated to an add on to the tour. The tour guide led us over to the Fullerton Arms pub where we were able to see one of the ten hand carved doors given by the Game of Thrones production company to pubs around Ireland. The wood from the doors was reclaimed from fallen trees (courtesy of Storm Gertrude) located at the “Dark Hedges” location of the show. The scenes carved on the doors are from scenes of the sixth season of the Game of Thrones. 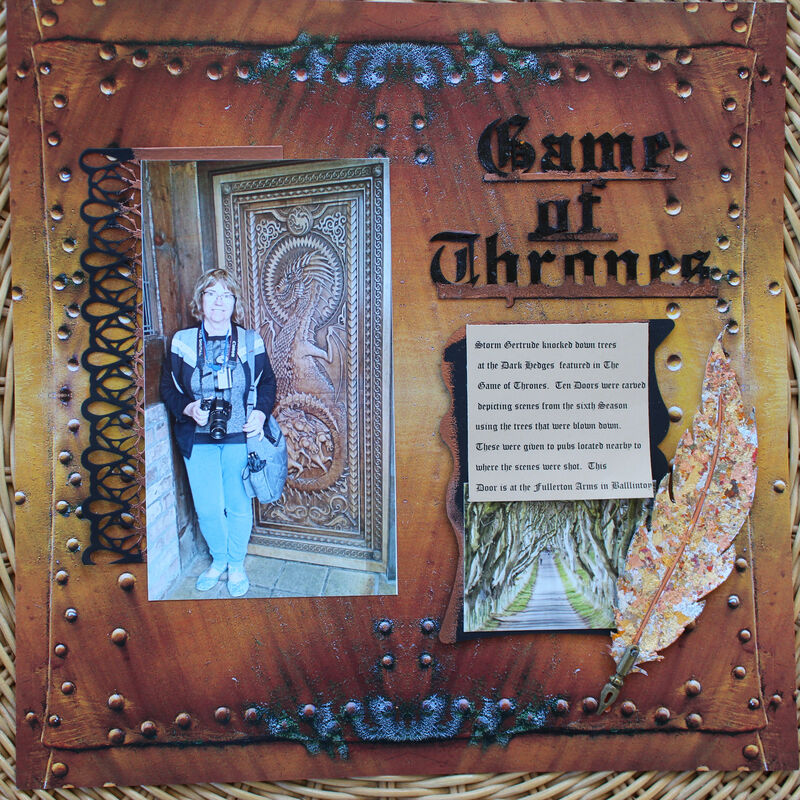 In the interest of full disclosure, I am not a Game of Thrones fanatic, but I am a Scrapbook fanatic and I thought there might be a great layout in the making here, and besides, I didn’t have to “pee” at that moment. I already had the background paper from Ella and Viv and knew it couldn’t be more perfect for the layout. I even reclaimed a feather pen from my reject pile of embellishments and fixed it up with Indigo Blu guilding flakes. So, I too, did my part with some recycling of my own! The small picture of the “Dark Hedges” was taken from the Game of Thrones website. Sometimes a collection comes along at just the right time. Heartfelt Creations recently brought out the Young at Heart collection. Usually, vintage does not really appeal to me, but when you are about to travel the Historic Route 66 highway, how can you not be drawn to the vintage cars and 1950’s ephemera of this collection. I combined the collection with some dies and stamps from my Southwest stash and I was happy with the result. It is funny how some things surprise you. When I was planning our trip to the British Isles this year and selecting tours to take, Dublin was the only stop where I had not eagerly selected a tour. I had been to Dublin before and had taken a hop on hop off tour that hit all the highlights of the city. In the end, I thought that since Ireland is famous for beer drinking, a pub crawl might be a fun alternative way to spend the afternoon. 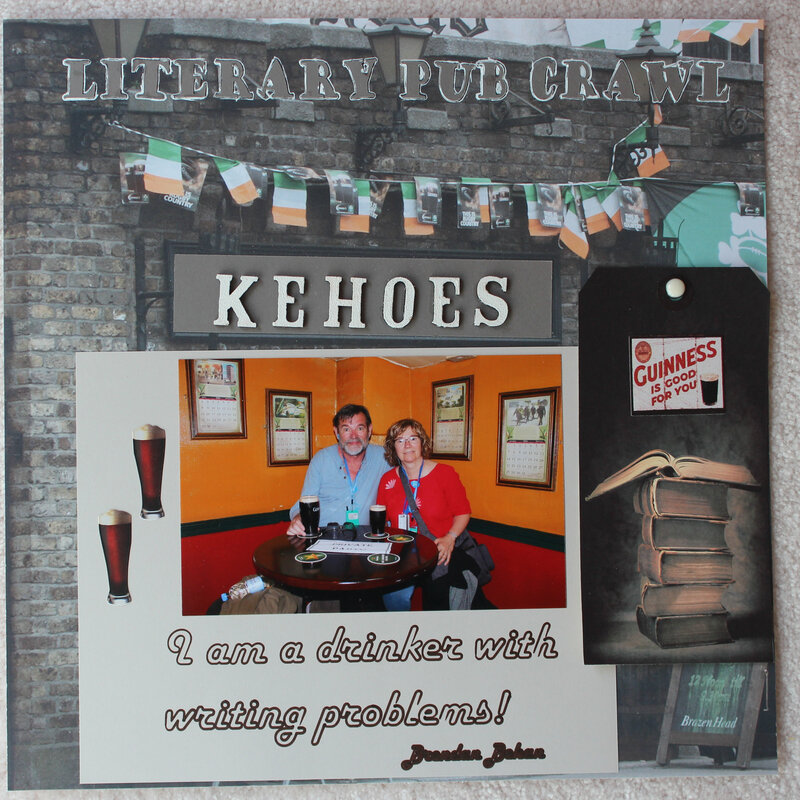 I was surprised to find out that the pub crawl I chose was not an ordinary pub crawl but a LITERARY PUB CRAWL. Apparently, many of the famous Irish writers got their inspiration while drinking a pint or two or three. It made sense then to learn more about these writers, while enjoying beer in a few pubs. How perfect is that? I love literature and my partner loves beer. It turned out to be one of the best tours of the trip. So far I have completed three double page layouts of the crawl. 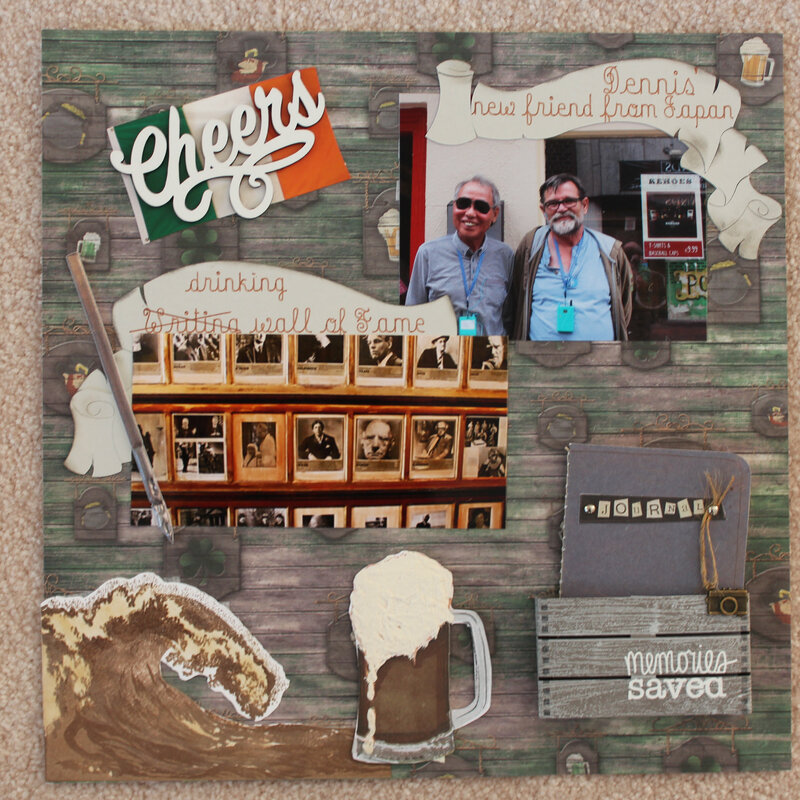 I am posting the last one I made as I am loving the Guinness beer and beer wave that I made. I shamelessly stole the beer wave idea from a card on a The Ton bloghop, but I can’t find it again to give proper credit to the designer. While I was in Phoenix this year, I was invited to a mystery event at the resort where I live. I was told that I should dress up and wear a hat to this event, but that was all. It turned out to be an English style Afternoon Tea put on by the quilting club. And when I say English, I really mean English, as you see the Queen herself attended, and consented to a picture with me and my friends. The extra exciting surprise to this event was that a famous hat maker now lives at the resort and was the guest speaker for the tea. Nancee Jelsema is a multiple award winning designer of Kentucky Derby hats, and spoke to us about how she developed her hat making business and about how she goes about designing these magnificent hats. She designed somewhere in the neighbourhood of 115 hats for this year’s Derby. Nancee has a seat at the finish line of the Kentucky Derby. This year she was wearing the black and red creation you see in the middle left picture. How magnificent is this? She also designed the stunning peach and brown hat, that my sister in law Gwen is wearing in the bottom right picture. Simply Smashing as the English would say! Now on to why this title on this blog post. I had noticed a blog post color challenge featuring almost the exact colour scheme I was using for this double page layout. Why not, I thought, tweak my layout to fit the color requirement of the challenge and then enter it into the challenge. Pursuing this, I followed the link given to the challenge. When I got to the website, I realized the challenge website was written in German………………………….no matter I thought………………………..a picture is worth a thousand words as they say………………….colours are the same in any language. I then proceeded to finish my layout. It was then that I remembered that this challenge did seem to have a number of rules. So back to the website I went where I discovered first a “translate” button and secondly, the rest of the rules. Sadly, for me, one of the other rules stated that the layout had to be done using Kaisercraft products. Oops! 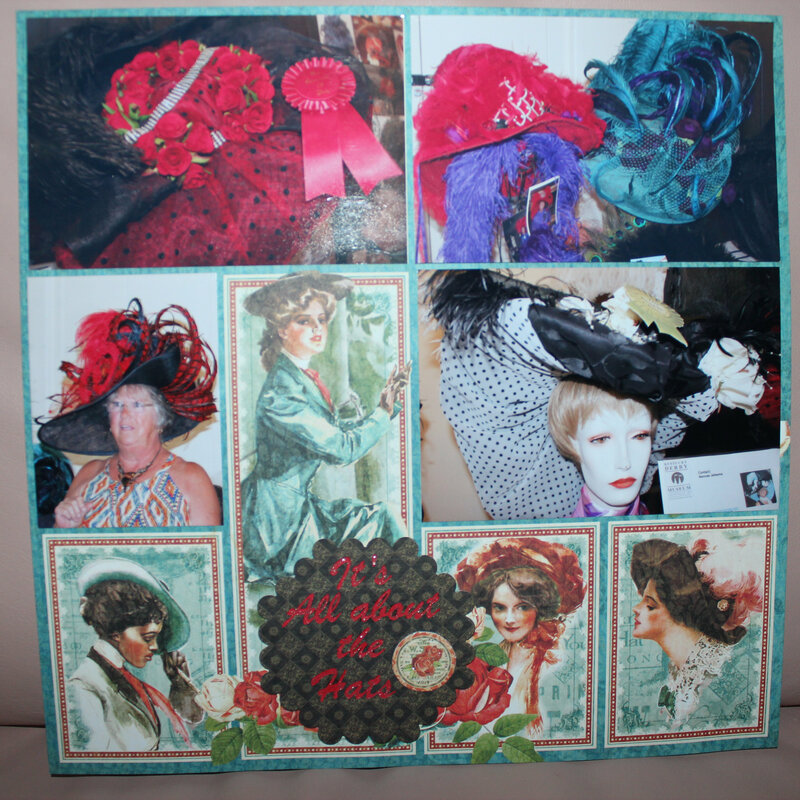 I have lots of Kaisercraft paper, but this layout was now complete using Graphic 45’s Off to the Races. So you see, I learned the importance of reading the rules first, and THEN designing the layout. Supplies: Graphic 45 Off to the Races patterned paper and diecuts, Heartfelt Creations Classic Rose stamp and die sets,Heartfelt Creations Delicate Border Basics, Spellbinders Scalloped Hexagon die, Elizabeth Crafts Jewels die, Nuvo Crystal Drops, Martha Stewart border punch, Recollections cardstock, Darice feathers, Prima twisted stems, Stickles. Sandra and I decided to visit The Bird Cage Theatre in Tombstone. Little did we know that “real ladies” would not go into this theatre with the tawdry history, They wouldn’t even be caught walking on that side of the street. Since our reputations were already sullied, we walked in. We intended only to take a peek at the lobby area, but we were taken by how the place looked exactly as it was in 1889……………..dusty bullet hole filled theatre curtains and all. We had to see more. It was called the Bird Cage because of the suspended from the ceiling compartments that are visible on both sides of the theatre. It is from these compartments that the “ladies of the night” plied their trade. The tour guide said that “often the men were too otherwise occupied to remember to close the red velvet drapes on the compartment so the audience received two shows for the price of one.” Now, the guide looked old, but not 1889 old, so I am not so sure about the source of his information. No matter, it caused a visual in our heads which was worth the price of admission. I could have made several pages just on this museum alone, but manged to pare it down to this two page layout. I ended up in Boothill! My Dad was a lover of western movies, so he was very aware of Tombstone, Arizona and the shootout at the OK Corral. He often said, “If I don’t watch out, I am going to end up in Boothill.” I always remembered that, so it was a special thrill for me to be able to actually see Boothill Graveyard. Tombstone is a little over the top, but I enjoyed pretending to be living in 1881 for a few hours. 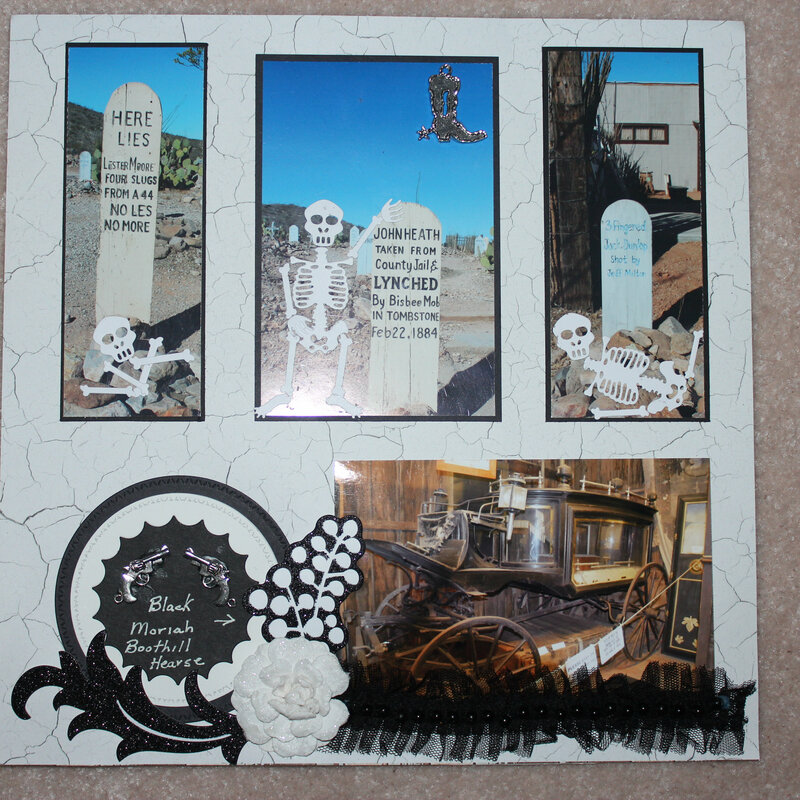 My layout of Boothill was designed to be as fun and lighthearted as Tombstone itself. I gave myself points for being able to use an old Tim Holtz gravestone die for the Journal card, tucked in the top of the first layout………………………double points actually………………because I used it on a non Halloween themed layout as well. These are the things I do to justify my rather large stash! Another wonderful season of enjoying retirement part-time in Phoenix, is wrapping up. I am starting to pack up and begin my annual “How am I going to fit all this stuff in my little car” routine. Yikes, I was doing so well until I booked that “I’m so excited and I just can’t hide it” cruise of the British Isles for this summer. It didn’t help that my favorite store that carries wonderful cruisewear has decided to go exclusively “online” and close all its’ stores. Now I have more cruise wear than the airline will allow me to take and some of it will have to be stuffed in the glove compartment, just to get it home. 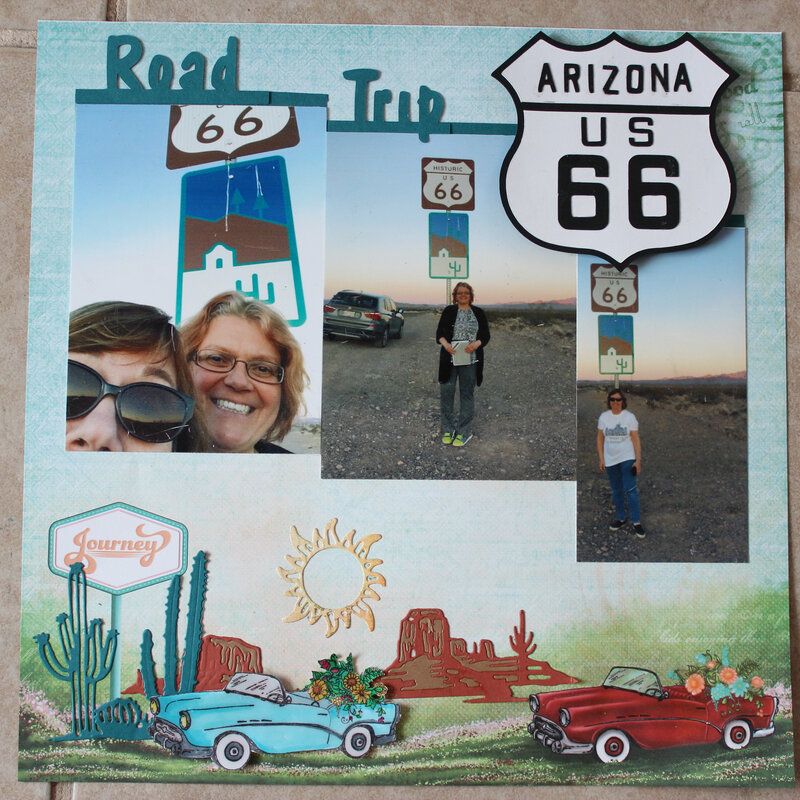 One of the many great things I was able to do while in Phoenix, was to go with Sandra on a ROAD TRIP to Tombstone Arizona. That was a bucket list thing for me, as my whole family were fans of the classic western when I was growing up. Somehow I had it in my head that the OK Corral was this huge place, with wagons to hide behind and windows to fall out of. Nope, all the participants stood facing each other with only a few feet between them. In spite of the close proximity, Wyatt Earp was not shot. Only the bad guys got killed (that day anyway). Anyway, the whole town is a hoot, and Sandra and I thoroughly enjoyed going back in time. We took in a reenactment of the Shootout at the OK Corral. I don’t know where they got the actors but they were exceptional at least in their physical appearance. The Earp brothers looked exactly like the historical pictures and the actor who played Doc Holiday was pencil thin. Doc Holiday was often described as emaciated (enjoyed taking self prescribed drugs too much, I hear). Posting a scrapbook layout about a beautiful red balloon that picked our Phoenix backyard to launch from. The brilliant red colour against the intense blue of the Arizona sky was quite amazing. Supplies: Backyard Ballon title cut on Pazzles electronic cutter and shaded with Copics, Cactus covered in Envirotex resin and popped up with Scotch foam tape. Sign made with Reverse Confetti All Framed up die. Waxed red twine from Monthly Hero Arts kit. Zigzag die is from My Favorite Things. Last summer I had the pleasure of visiting Vancouver Island. Although I had been there several times in my life, I had never before seen the magnificent sandcastle building competition held in Parksville, British Columbia. This year the theme was “Things with Wings”. The creativity was out of this world and so was the artistry. 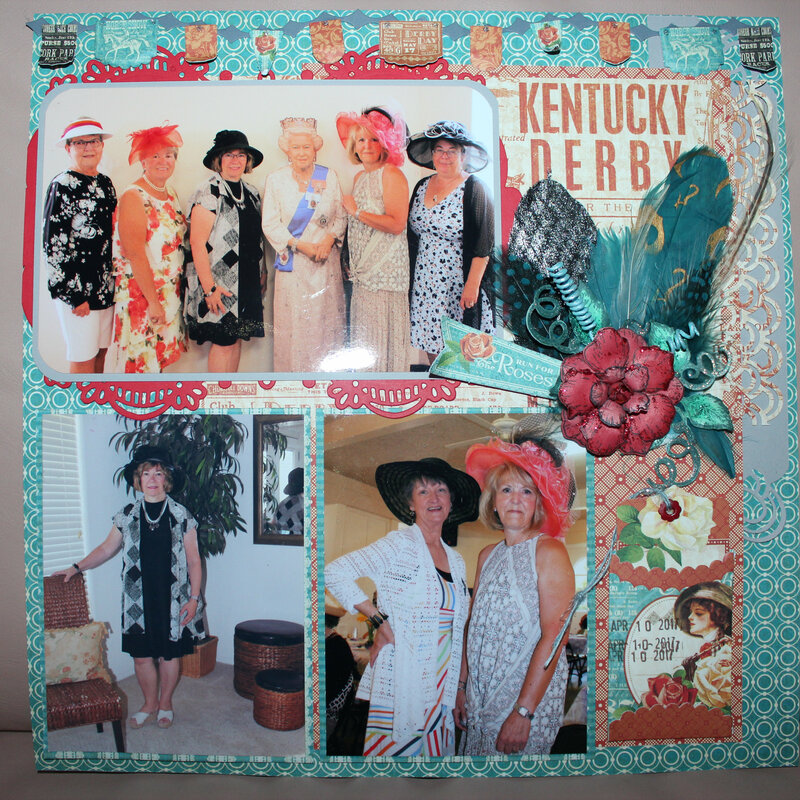 Here is the scrapbook page I created to remember the event.